We are excited to help your kids learn how to climb. From problem solving, to building confidence, and learning how to evaluate and take risks, your kids will discover rewarding life lessons from climbing that are applicable both on and off the wall. Our youth program offers monthly indoor rock climbing clubs. Get started today by clicking a club registration link below, giving us a call, or dropping by to sign up in person. Questions? Click Here for more information about our enrollment process. Member and Non-Member tuition is paid on a monthly auto-pay basis. If you would like to cancel your tuition please notify us within 10 days of the next tuition cycle. Prerequisites: There are no prerequisites for our Pre-school club. Pre-school Club teaches the essentials of climbing, problem solving, bear hug rolls, and more. Classes combine structured and experiential learning to captivate and challenge our climbers. Pre-school Climbers Club is mostly instructed inside our Monkey Room, a special space designed for the physical, cognitive, and emotional needs of these youngsters. * Training Center membership required for discounted pricing. Prerequisites: There are no prerequisites for our Beginner Club. If your kid is a natural climber or needs a fun, confidence, and self-esteem boosting activity, join us to explore the basics of rock climbing. In Beginner Club, we work on developing a basic skill set that includes gym etiquette, proper falling technique, vocabulary, and the fundamentals of movement. Climbers will continue to build upon this foundation as they move through our program. Prerequisites: Coach’s Recommendation or climbers 13 or older. Our Intermediate curriculum builds on the foundation of movement skills established in our Beginner Club. We refine precision in movement and emphasize planning ahead by visualizing movement before getting on the wall. As a result, climbers expand their problem-solving skills. We also introduce climbers to ways they can build core strength and endurance with short workouts. The Advanced Club curriculum emphasizes technical movement, strength versus endurance training, outdoor climbing techniques, a few mock-competitions, mental toughness, and more intense workouts. This class is a two-day per week commitment and is offered for dedicated young climbers interested in competitive climbing or who visualize themselves as lifelong climbers who want to learn how to climb on real rock. Prerequisites: Coach’s recommendation and a strong desire to compete. The Competition Climbing Club has a strict focus on well-rounded, competition-readiness. 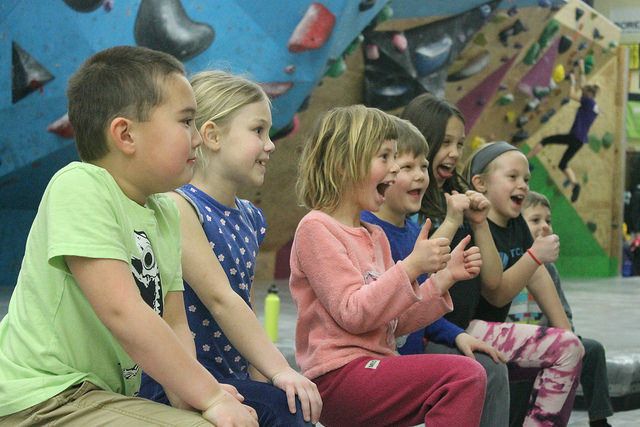 With two practices per week, this program revolves around solidifying climbing fundamentals, building physical fitness, improving mental toughness, and competition. Athletes at this level will be expected to participate in competitions hosted at Vertical Adventures (about 2 per year). Prerequisites: There are no prerequisites for our Adaptive club. Adaptive Climbing Club for Kids is designed specifically for anyone with a disability or exceptionality. Climbers will learn how to navigate the gym, develop positive social skills, and increase muscle tone, all in a controlled and encouraging space where they can practice and progress at their own pace. We’re offering NEW climbers a FREE class to experience our program.